Robert Francis Roode Jr. (born May 11, 1977) is a Canadian professional wrestler best known under the ring name Bobby Roode. He is currently signed to WWE, where he performs on the Raw brand under the ring name Robert Roode. He is best known for his 12-year tenure working for Total Nonstop Action Wrestling (TNA) from 2004 to 2016. He debuted as part of Team Canada in 2004, becoming NWA World Tag Team Champion with Eric Young. After a singles run following the team's breakup, he formed a tag team with James Storm as Beer Money, Inc. Together with Storm, he is a six-time TNA World Tag Team Champion and they are the longest reigning champions in TNA history. Roode eventually became a two-time TNA World Heavyweight Champion, with his first reign being the longest reign in the company's history at 256 days. In his later years with the company, Roode also won the World Tag Team Championship with Austin Aries and was a one-time TNA King of the Mountain Champion. On April 16, Roode was moved to the Raw as part of the Superstar Shake-up. In his Raw debut, he was unveiled as the surprise member of the ten man tag match in which he teamed with Bobby Lashley, Braun Strowman, Finn Bálor, and Seth Rollins in successful fashion as they faced off against The Miz, Bo Dallas, Curtis Axel, Kevin Owens, and Sami Zayn. At the Greatest Royal Rumble event, Roode performed in his first ever Royal Rumble match, lasting just under eighteen minutes before being eliminated by Baron Corbin. Roode's first rivalry on the Raw roster was with Elias with the pair trading victories over the months of April and May. On the May 14 episode of Raw, Roode defeated Baron Corbin and No Way Jose to qualify for the Men's Money in the Bank ladder match at Money in the Bank on June 17, which was won by Braun Strowman. On the September 3 episode of Raw, Roode started a partnership with Chad Gable and went on to defeat The Ascension. At Survivor Series, they would lead the Raw tag team division, but they would lose to Team SmackDown in a 10-on-10 Survivor Series tag team elimination match. After feuding with them for weeks, Roode and Gable defeated AOP (Akam and Rezar) and their manager Drake Maverick in a three-on-two handicap to capture the Raw Tag Team Championship on the December 10 episode of Raw, after Roode pinned Maverick. At TLC: Tables, Ladders & Chairs, Roode and Gable along with Balor, Crews and Angle helped Strowman defeat Baron Corbin in a Tables, Ladders, and Chairs match and Corbin was stripped of all authoritative power. Roode and Gable would go on to beat The Revival in title matches on back to back weeks and again on the January 21 episode of Raw. At the Royal Rumble kick-off show, Gable and Roode defeated Rezar and Scott Dawson in a non-title match. The match stipulation stated that if Rezar and Dawson were to win, their respective teams (AOP and The Revival) would both receive tag team championship matches. The Revival would eventually receive their title match on the February 11 episode of Raw, in which Gable and Roode lost the championship.. On the March 4 episode of Raw, Roode and Gable interfered in The Revival's match with Ricochet and Aleister Black, attacking both teams. 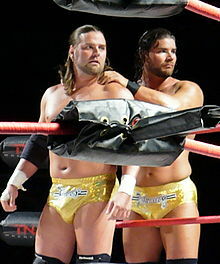 At Fastlane, Roode and Gable competed in a triple threat tag team match for the Raw Tag Team Championship, which was won by The Revival. At WrestleMania 35, Roode competed in the André the Giant Memorial Battle Royal, but was unsuccessful. The following night on Raw, after losing a tag team match to Ricochet and Aleister Black, Roode and Gable turned heel when Roode attacked Ricochet. This would be Roode's first time as a heel on the main roster. On April 16, Chad Gable was drafted to SmackDown during the Superstar Shake-up, disbanding the team and leaving Roode on his own. 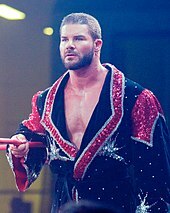 On the April 22 episode of Raw, Roode introduced himself as a repackaged new character by the ring name of Robert Roode, a name he had previously used in his career during his tenture in TNA, and Roode also shaved his beard and went with a moustache look. Commenting on Gable getting drafted he said, he had never felt better in his entire life now that Chad Gable had been drafted to SmackDown and he had lost dead weight. Later in the show, Roode was victorious against Ricochet.